The original edition of Michael Pollan’s Food Rules, An Eater’s Manual came out a little more than three years ago, in January 2009. Its publication immediately inspired readers to send Mr. Pollan suggestions for additional “rules.” Pollan notes in his introduction to the new illustrated edition of Food Rules (The Penguin Press, New York, 2011) that he wished he had thought of and included some of these additional rules. 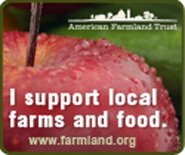 In addition, when he asked Slow Food USA to put out a solicitation to members online, “4,230 rules came back in a few days.” While pondering these suggestions for additional rules, Mr. Pollan was also considering “”doing something more visual with the rules, maybe a poster, as a way to reach as many people as possible.” Pollan’s wife Judith “hatched the idea” of asking Maira Kalman, the talented artist whose cover art and cartoons for the New Yorker Magazine has earned her a wide audience, to collaborate on the new edition. This wonderful new version of Food Rules, illustrated with humor and a colorful palette by Ms. Kalman, and an additional nineteen food rules (for a total of 83 food rules) is certain to achieve Mr. Pollan’s goal of reaching a wider audience for his remarkable book, which answers (succinctly, humorously, and bravely) one of the major questions of life: What should I eat? The answer to this vital question remains the same in the new edition: Eat food. Not too much. Mostly plants. Food Rules is organized into three sections which address a “different dimension of your eating life.” The first section, Eat Food, helps to distinguish real food (plants, animals, fungi) from “edible foodlike substances.” The second section, Mostly Plants, helps the reader to choose among real food. The third section, Not Too Much, deals with how rather than what to eat, with rules which help readers moderate their eating and enjoy food more. For a book that has the authoritarian word Rules in its title, Michael Pollan’s Food Rules prompts smiles and chuckles and is a rulebook full of good cheer. Maira Kalman captures the overall tone by noting that Food Rules “asks us, gently, to hit the reset button on manufactured food and go back in Time.” The only note of sarcasm comes very early on when Pollan cannot resist noting: “What an extraordinary achievement for a civilization: to have developed the one diet that reliably makes its people sick!” Of course, the good cheer of the author does not keep him from critiquing the Western diet “consisting of lots of processed foods and meat, lots of added fat and sugar, lots of refined grains, lots of everything except vegetables, fruits and whole grains” [emphasis in original]. Mr. Pollan speaks plainly and bravely when he ties the “high rates of the so-called Western diseases: obesity, type 2 diabetes, cardio-vascular disease and cancer” to the Western diet of highly processed foods. According to Pollan, “Virtually all of the obesity and type 2 diabetes, 80 percent of the cardiovascular disease, and more than a third of all cancers can be linked to this diet.” He emphasizes the fact that “People who get off the Western diet see dramatic improvements in their health.” A staggering “three quarters of the $2 trillion plus we spend each year on health care in this country” goes to treating chronic diseases, when the focus should be on preventing them. Mr. Pollan bemoans public health campaigns that, instead of targeting the American diet of processed foods, focus on “identifying the evil nutrient in the Western diet so that food manufacturers might tweak their products, thereby leaving the diet undisturbed, or so that pharmaceutical makers might develop and sell us an antidote for it.” This past fall, Mr. Pollan spoke to a full-house at a local college [knowwhereyourfoodcomesfrom.com/2011/10/26/michael-pollan-speaks-to-full-house-in-troy-ny/]. Strolling on to the stage with two bags of food just purchased at a nearby Price Chopper supermarket, Pollan began his talk by displaying to the attentive audience his supermarket purchases of “Products I haven’t seen before,” including a cereal “modeled on candy,” Reese’s Puffs Whole Grain . It was the “Whole Grain” designation on the colorful package that drew Mr. Pollan’s withering eye to lend support to his contention that the food industry borrows the halo of nutritionism to “muddy and confuse.” Instead of focusing on “nutritionism,” which now undergirds the marketing of so much processed food, Mr. Pollan presented a forceful argument that any traditional diet of real food is superior. In his view, why a carrot or an apple is good to eat is a continuing mystery. This mystery cannot be solved by merely analyzing the nutrients: A carrot is more than the sum of its nutrients. The final section of Food Rules which deals with “how” to eat notes the French paradox: “a population that eats all sorts of supposedly lethal fatty foods, and washes them down with red wine, but which is nevertheless healthier, slimmer, and slightly longer lived than we are.” This paradox is rooted, according to Pollan, in the “completely different relationship to food” of the French: “They seldom snack, eat small portions from small plates, don’t go back for second helpings, and eat most of their food at long, leisurely meals shared with other people.” Perhaps one of the most difficult rules for the American eater is Rule 55, “Stop eating before you’re full.” A global diversity of sayings lends support to this rule. “The Japanese on Okinawa have a saying- hara hachi bu– that counsels people to stop eating when they are 80 percent full. The Ayurvedic tradition in India advises eating until you are 75 percent full; the Chinese specify 70 percent, and the prophet Muhammad described a full belly as one that contained one third food and one third liquid- and one third air, i.e., nothing. . . there’s also a German expression that says: You need to tie off the sack before it gets completely full. . . Here again the French may have something to teach us. To say ‘I’m hungry’ in French you say J’ai faim– I have hunger, and when you are finished, you do not say that you are full, but Je n’ai plus faim– I have no more hunger.” Rule 57, “If you’re not hungry enough to eat an apple, then you’re probably not hungry” has become a rule that pops into this reviewer’s mind almost on a daily basis. To take a moment before a meal to reflect on the work, and the wonder, involved in the process that brings food from the earth to your table is to eat it with both more pleasure and more consciousness. 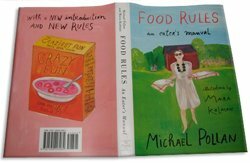 Michael Pollan and Maira Kalman deserve gratitude for this updated, illustrated Food Rules, a book to be treasured.